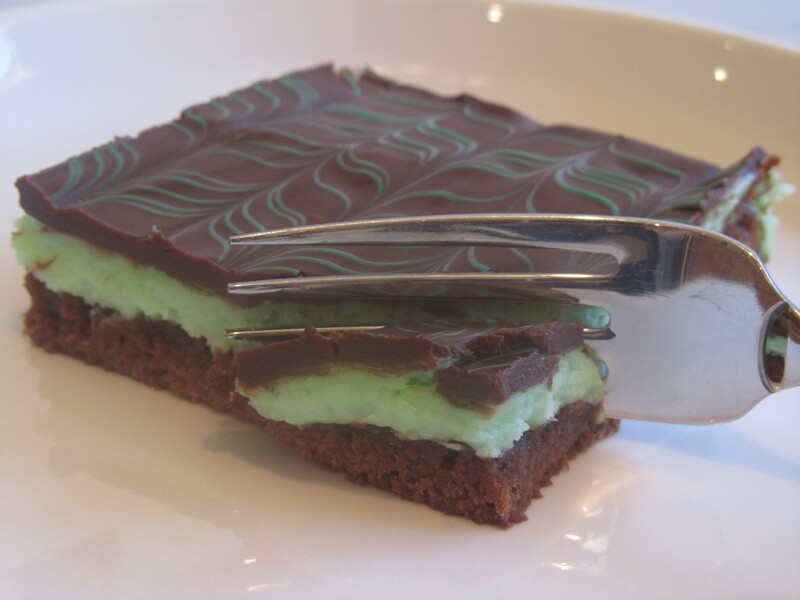 If you like mint with your chocolate these brownies are the recipe for you! Rich and chewy, these brownies are topped with a creamy mint layer and rich chocolate. Add melted butter to sugar and extract. 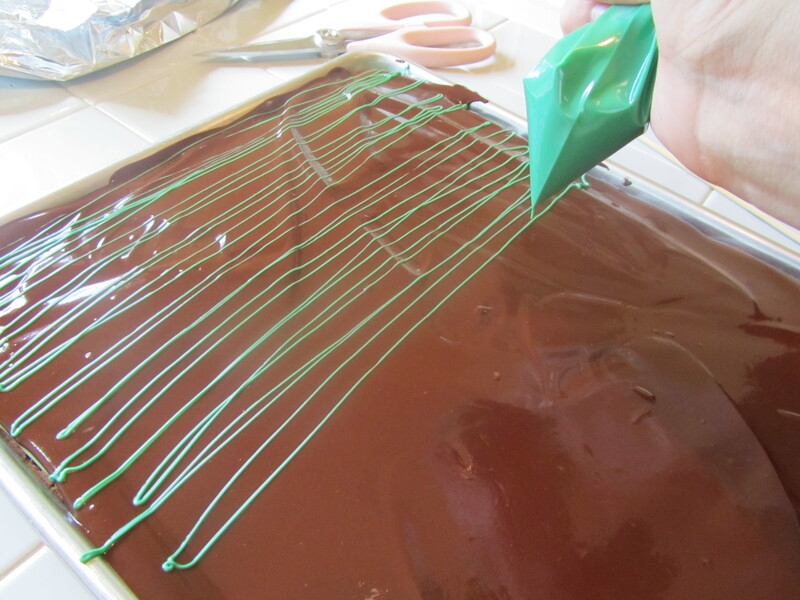 Add food coloring to desired shade of green. Spread over cooled brownies and chill for a few minutes to harden up. 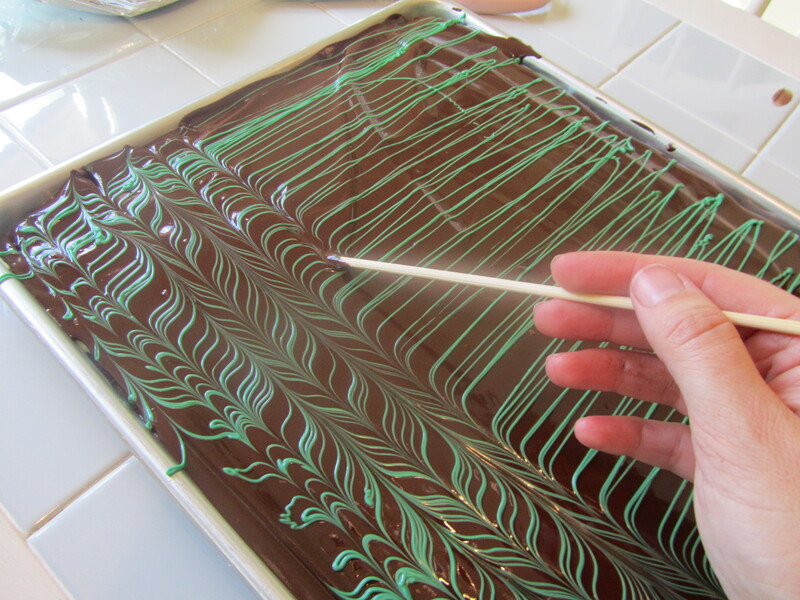 Using green chocolate melts that are melted and placed in a ziplock with a corner clipped, drizzle over the top of the warm glaze. Draw a tooth pick , knife or skewer through the chocolate- 1st one direction and then back the other to make a fun design on the top of these bars. 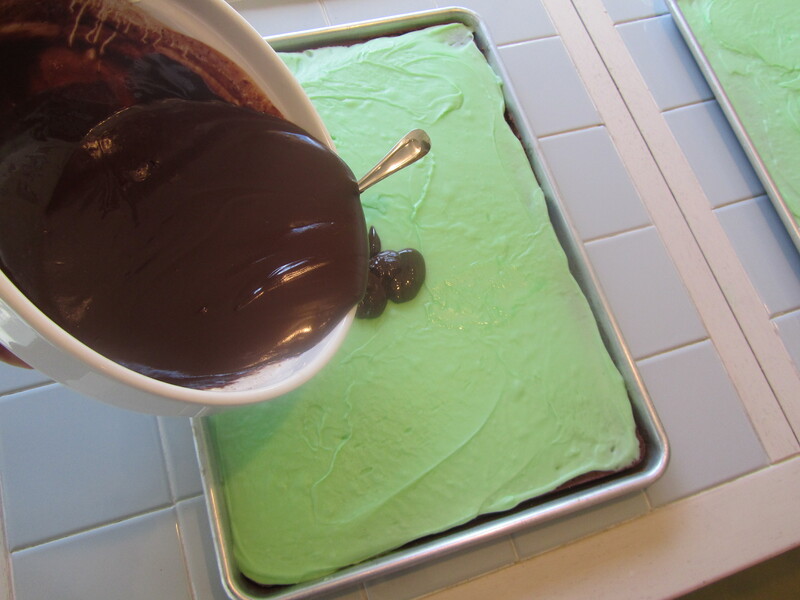 Posted in Brownies and tagged andes mint, brownies, chocolate, chocolate glaze, dessert, mint, peppermint. Bookmark the permalink. Thanks Alyssa– love your blog- so fun 🙂 I linked my chocolate cheesecake fudge. Thanks for the invite! Looks great!!! Can’t wait to try them. What size jelly roll pan? Standard jelly roll pans are 10 1/2″ by 15 1/2″. Mine is just a touch bigger, so my brownie layer is a little bit thinner. Enjoy!! This sounds so yummy. Is the butter in the glaze 12 tablespoons or teaspoons butter? Just use 12 tablespoons. It works well with less, but to make things less confusing I will just make both recipes the same. Pingback: 22 Ways to make your brownies yummy! Ruthanne, my family is officially addicted to your Chocolate Chip Cookie dough Brownies! I see the recipe for the mint filling, caramel filling, and peanut butter filling … any other filling ideas? I LOVE LOVE LOVE your blog!